Under Tarp Pole with a DCF tarp? Thread: Under Tarp Pole with a DCF tarp? Just ordered a HG Standard with doors and posted on the HG vendors forums a few times hoping for some input. 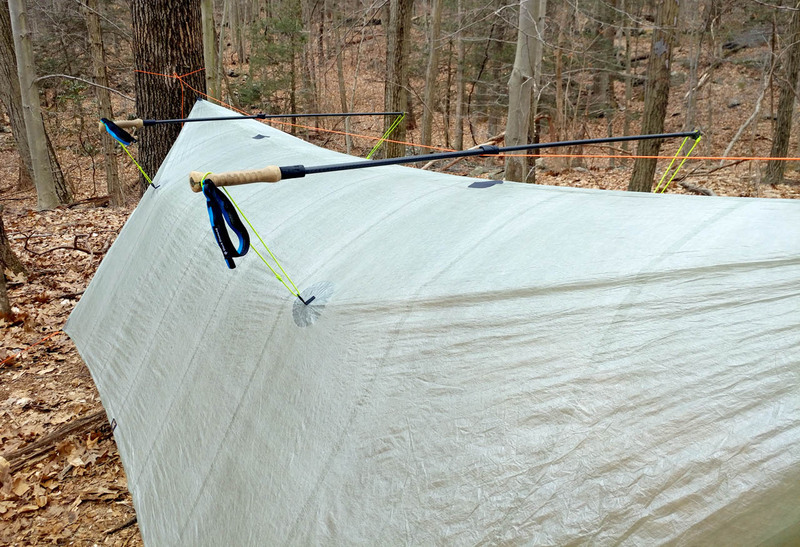 I have had half a dozen tarps in silnylon and silpoly, that all used the same single internal center pole and I love the spacious cavern it creates and that it keeps the tarp off my side when the wind is up. Has anyone tried a single center internal pole on a DCF tarp or should I give up on that idea? I popped in today with this exact question. Just finished a Winter12 knock off in .67. Would love to try a two pole set up but have the same questions you do. However. Dutchware is fairly close to us so I’m probably going to call over there and see what they think. They sell 10ft premade poles which would be too long for the 9ft width that I could get out of the 54” DCF. Do you really want to add weight to a tarp you spent a lot of money on to save weight? Many folks one or even a few luxury items. Carrying the pole doesn’t change the fact that I saved nearly a pound on the tarp does it? Hey buddy, here is a better setup of what we were playing around with Sunday. I could not get the RL sufficiently taut then because of one of those skinny trees, but here it is as set up yesterday in my local woods, done right with some hang-worthy trees. I also put on those reinforcement patches in case the RL does sag and the tarp gets sandwiched between the poles and the RL/SRL. I cut some two inch circles from the DCF I have.. I'll put some transfer tape on the back to use for reinforcements. Yes, those poles are extended all the way. I made some whoopies for the door, so my tweaking is pretty much done. I might make and carry a couple of those little clip-on cord adapters we discussed for staking out the doors... only needed on one end, really. I use a little shock cord dogbone from the tie out to the trekking pole... Makes the connection easier to make and gives the shock absorption. Otherwise I like what Bob has going there- including the just in case RL patch. That's an easy enough thing to add and I suspect even if you found it wearing a bit over the season it really isn't going to hurt anything to slap another on if you wanted to lay the trekking pole right on the RL of the tarp. A piece of tenacious tape may even be the better choice if you get the heavier version. Big value for little weight IMO as well regardless of how you do it. I'm still dipping into the trekking pole thing overall- but with the bridges I'm favoring using one pole for the tarp, one for the bridge. Them boys is talking about the external pole mod... the 10' pole is for an internal poll mod. But- they are easy enough to trim with a pipe cutter so if the internal is what you're looking for you can easily trim them slightly to fit your tarp. You just have to pull out the tips, untie (or cut) the shock cords then trim each end pole to fit. (best to trim equally on both sides rather than whack out all of it on one side if you're trimming more than a few inches). For internal pole mods... you can set them up so they fit into a beastie D but I prefer them to run a few inches past the sides of the tarp and hook the tarp to the pole with a little shock cord. With Nylon you can stretch the tarp a little, but with DCF you will be more likely to tear out your tie-out trying to wedge the pole in. JB... I cut each pole on one end only.. the female end. Cutting the male end would reduce the amount of pole making purchase inside the corresponding female pole which would reduce the strength IMHO. I simply measured the full pole length and divided that by the number of poles. I trimmed them on a miter saw. Keeping them all the same length makes them easier to pack... A neater collapsed bundle. At this point, I've abandoned the idea of using the internal pole on DCF tarps. While my silpoly tarps were the same length and used the same pole, my cuben tarps are different widths so a common internal pole won't work. But common exterior poles (or my CF trekking poles) will work fine. Would like some feedback on an idea for pole solution to go with pole mod on tarp. Wilderness Logics OMW tarp 1 or 2 pole, pole mod?